I received the mentioned product from Cave Tools in exchange for an honest review. The thoughts contained within this post are mine and may vary from the thoughts of others. Unique 2 in 1 Design Gets The Job Done Without Needing Multiple Tools – Great for Cooking Ribs, Roasts, Chickens, Turkeys, Hams and more! We are a grilling family. I got so lucky to marry a grill master after growing up around one (my very own Dad!). We grill so often and love using a charcoal grill over a gas one. I feel like there is just so much that you can do with a charcoal grill and the options are endless. 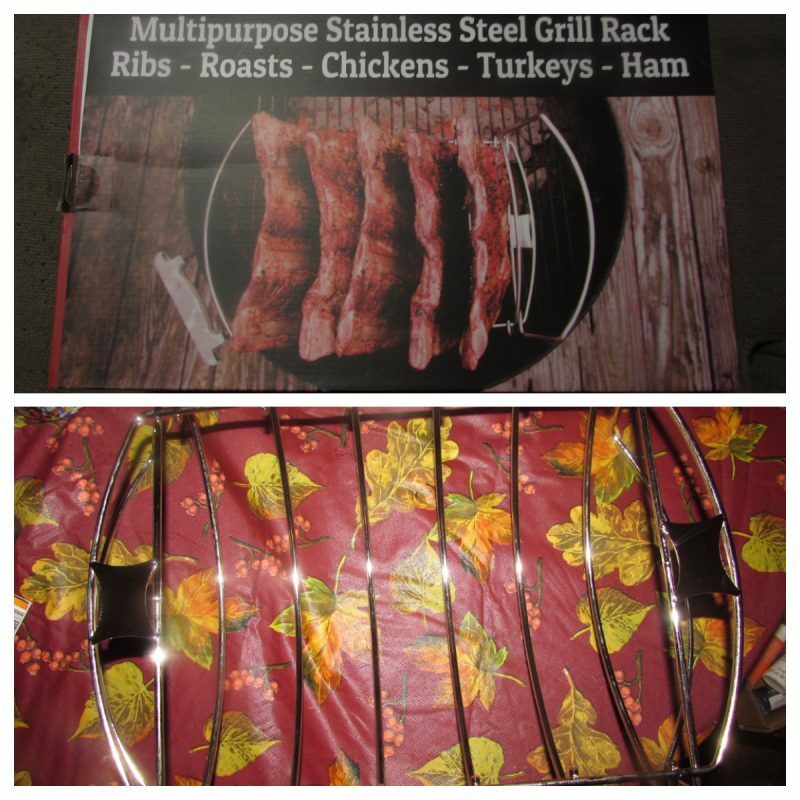 Several weeks ago we got this awesome Rib Roast BBQ Rack from Cave Tools and found that you can also use it for grilling whole chickens, turkey, of course making ribs and so many other things. I found that from the package this rack was really easy to use. I first grabbed a whole chicken from the store. We got a big plumb nearly 6 pounder. I have some hearty eating guys here and also wanted leftovers for lunch the next day. Literally I did not do a lot of prep on the chicken other than sitting the rack on a cookie sheet to easily transfer it outside. Obviously I washed my bird, took the “other” parts out and melted some butter. 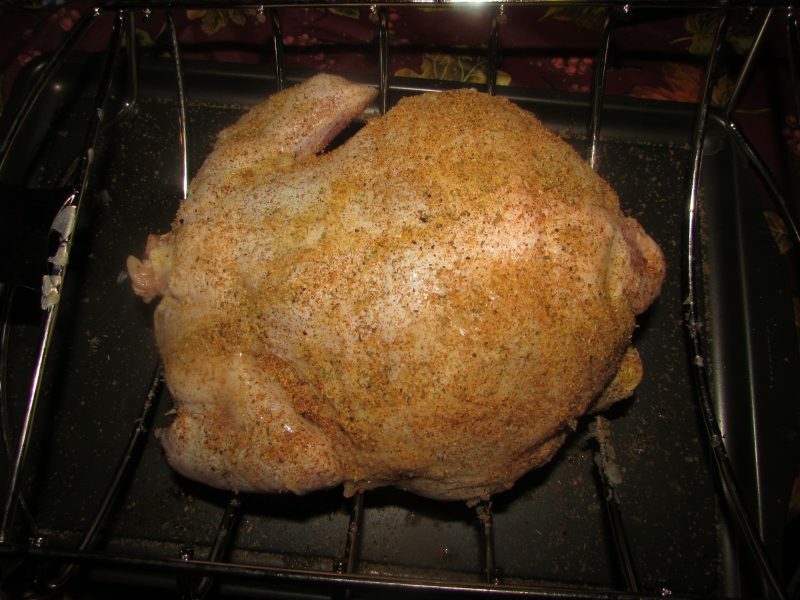 I applied the butter all over the bird and applied some spices: pepper, a bit of seasoned salt, some chicken seasoning from the Hispanic section of our grocery store and a bit of Tony’s (if you don’t know about Tony’s seasoning, get to know about it!!) Nothing else was done and we of course had gotten our coals ready. For those who use charcoal you know that sometimes it is hard to get it going, but we use a charcoal chimney which was a gift from my parents and get it going quickly every single time. So okay, the grill was hot and ready when we headed out the door with the bird and we left it on for 1 hour to smoke/cook. 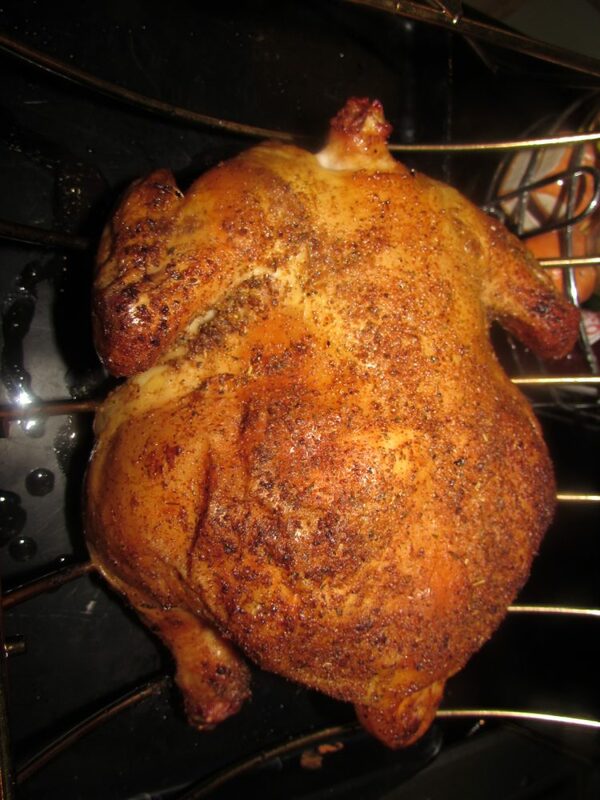 Pictured is the finished product– A chicken that was crispy, delicious and filled with natural juices. Anyone would have been proud of this bird, especially my husband the grill master. If you are looking for a great gift for anyone that loves to grill, check out Amazon and get yours today for only $19.99. Buy 2, because once you taste food from this rack you will want one too. Cave Tools offers many other great grilling products, too.